We stored our bacteria samples in sterile cell sample jars, with filtercaps, so that an atmospheric exchange with the environment was possible. These filter allowed the necessary Oxygen and more importantly nitrogen from the atmosphere to pass through, but kept the bacteria or other microorganisms from passing through. This was important, because we wanted to make sure that each sample contained only the desired Cyanobacteria, without any other organisms or foreign containments. This is known as "Batch Culture". Sterility was also very important to maintain while manufacturing the medium for the cultures. 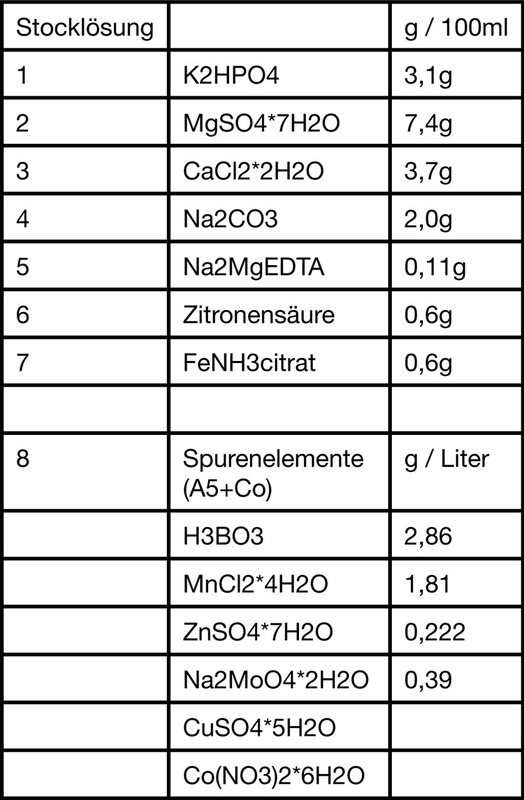 After mixing the medium (BG 11 no N), the mediums were autoclaved, and rinsed with a sterile, filtered 1 molar salt solution with a pH value of 7.4. All of our tools, and containers were also sterilized and every measurement performed in a clean cabinet under the highest hygienic conditions. How does one measure the growth of single cells? With a higher cell count, the ability of light to pass through the solution decreases. Therefore the photometer was the perfect measurement tool for us. A photometer sends a controlled light beam through a flask containing liquid. As the light beam passes through the solution its intensity is diminished. This can be measured by a device on the other end, and an Extinction value determined. We conducted all of our work with a wave length in the light beam of 820 nm. The dry weight of the samples was determined by sucking 100ml through a fiberglass filter, with an accuracy of .0001g, with a vacuum pump. The filter was then placed in a drying compartment at 70-90 degrees Celsius and completely dried. Then by comparing the mass differences, we could determine the dry mass of 100ml of the culture. remaining nitrogen is analyzed in a thermal conductivity detector. (Cited from http://www.labworld.at/Produkte/Labo.../Dumatherm.pdf) In a Thomas-Counting Chamber under the mircoscope we probed and counted the exact number of cells per µLiter substrate. Thus we could count the Heterozysten. Now that we had our measurement protocols, the next thing we needed to do was construct an artificial habitat for our Cyanobacteria. In order to create a standard environment in which to grow our cultures, we blacked out all the lights and windows of a room. Then we proceeded to set up artificial sunlight lamps (Spectral distribution 965, Osram ex. Philips) To simulate a normal day cycle we had all the lamps set on timers. In order to document the changes in light intensity and temperature, we constantly monitored the room at predetermined increments. For the light we used two measuring devices to meausure Lux and Micromol Photons per quadratic meter per second. The Luxmeter was a LX-1108 from Voltcraft, and the Micromol was a Light Meter LI-250A with sensor LI-190SA from LO-COR. Otherwise, our petri dishes were measured from three difference heights. On our first try we noticed that too little light was being radiated out. In order to increase the light intensity for out measuring devices we attached a mirror to the back side of the shelves. We measured temperatures of 25-30°C. 1. The Lag-Phase. In this phase the bacteria spread over the substrate and begin to build enzymes and other materials in order to be able to absorb nutrients from the medium. 2. The Log-Phase. The bacteria have spread optimally over the substrate and begin exponential growth. 3. The Stationary Phase. The number of dying cells is equal to the number cells being produced. 4. The Death Phase. The cells begin to die as they have exhausted their food supply, or there is no light energy to fuel photosynthetic reactions, or because the byproducts of their growth have become toxic pollutants. So that our experiments would all start in the Log-Phase we started each culture in 300ml of nutritional medium. Than we placed these first cultures under the light lamps and allowed them to grow. When they reached an extinction rate of 0.1 we thinned them with a liter. Then we split them into four petri dishes, so that the bacteria could get as much light as possible. These then became our test dishes. Each of the samples was labeled with its contents. There were four cultures of each sample. Every day each of these samples had to be shaken in order to disrupt the buildup of plaque on the container's walls. Plaque would block the light beams we used in our measurements. Every Monday we made photometric measurements. Every Thursday we made another set of measurements as well as a dry mass measurement and froze a militer specimen for later measurement of the nitrogen fixing underway. Ambient light intensity and temperature was measured both days and everything was recorded in our log book. Sample number 4 was seen as the favorite, however it had a too low dry mass production. Our advisor Johanna Schmidt from the Institute for Limnology gave us a tip, that we should raise the light intensity by around 200 Micromol Photons per quadratic meter per second. Up till now we had been running a fairly low light intensity of only 12-40 Micromol/m2/s in our setup. So we raised the light intensity by the advised amount, and than ran into our second problem. The lamps heated up a lot, and raised the temperature in the test tubes up to and over 35 °C. Then we noticed that the younger cultures were allowing too much light through, while the older and more thick cultures allowed less light through. For the first problem we simply moved the lamps further away and placed a ventilator on the other side, which cooled the test samples back down to a nice 28 °C. In order to acclimatize the the cultures to the intense light, we placed the new cultures on a shelf which only had a single lamp, and then after a week moved them down to the light racks. We also decided to only measure the light in Micromol/m2/s. Because the Lux-value could not give us valid information. The Lux measurements are designed for living rooms and houses, so the inhabitants can measure the light radiation and heat, but for scientific inquiries the device is too imprecise. The difference in results between the commercial and professional measuring devices were noted in out log book.